Selecting a favor that's not only memorable but also useful is surely the way to go! 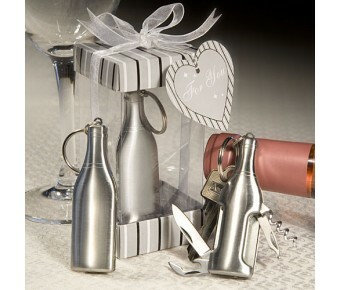 And these stainless steel bottle opener favors are a tasteful way to add to your special day. 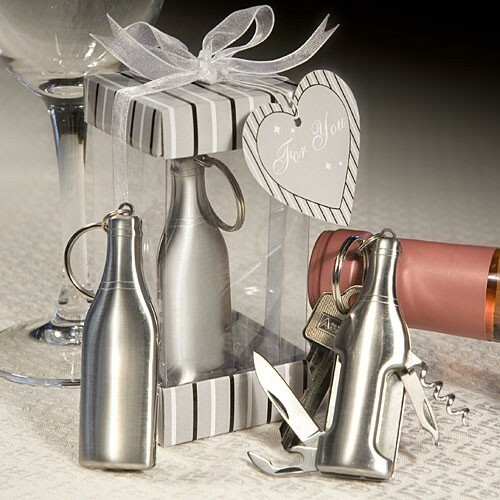 Each is 3" x 1" x 0.5" in the classic wine bottle shape with a metal chain and key ring top and a set of retractable blades and corkscrew tucked inside. From Fashioncraft's exclusive "Amore Stainless Steel" collection, each comes attractively packaged in a signature clear plastic display box with a silver, black and white striped top and base, tied with a white organza bow and an attached matching striped heart shaped "For You" tag.